With the timeline having been changed unexpectedly and the future Eobard Thawne officially giving up hope of fixing things, Nora is urged to come clean to her parents in the past about who she's been working with. Unfortunately, Nora isn't the only time-traveler in Central City 2019, with an adult Grace Gibbons having taken up her uncle's mantle as Cicada now hunting down the metahuman responsible for killing her parents. Seriously, where has Ralph been for the last two weeks? Did it really take him that long to check in with all his local underworld contacts? The new Cicada is said to have the power to negate other metahuman's powers, but Barry and Cisco didn't seem to have any troubles last week in their first fight with the future Grace Gibbons. Much as we hate to side with the villain, we do have to agree with future Grace Gibbons that the CCPD were rather negligent in investigating her parents murder. While putting out an APB for every woman wearing a hoodie would have been impractical, it seems like after an ATM blew up they might have checked the records to see who used the ATM immediately before it blew up on the off chance it might have been their bomber. While we're used to the rules of time travel and how quickly changes are made to the future when something in the past is changed being entirely dependent on the plot at this point, it seems like we should have seen an instant paradox take effect when Future Grace kills her uncle, whom she said trained her to become the new Cicada. Why doesn't Future Grace Gibbons kill The Flash after she kills her uncle Orlin?! I've missed Jesse R. Martin's expressions when he deals with the madness around him. The effects work on the scene where Barry tries to outrun Cicada's dagger in a narrow hospital hallway while changing into costume does look fantastic. The party that the new Cicada crashes is being held at a Central City business called Crash Crawly's. This is the name of a real-world kid's party restaurant in British Columbia, similar to Chuck E. Cheese's in the United States and it uses the same logo. Ralph makes reference to "Peter Parkering" Kamilla, getting her a job working for Iris' newspaper. This is of a course a nod to Spider-Man's secret identity and how Peter Parker paid his bills as a photographer for The Daily Bugle. Ralph goes on to say that maybe Kamilla will be bitten by something radioactive hanging around STAR Labs and become a spider-person. 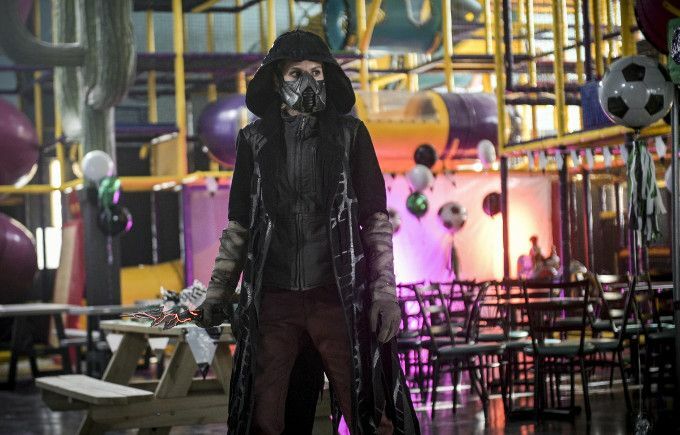 Future Grace has a device in her costume that can track the unique dark matter signature of a particular metahuman, getting close to an exact real-time location. Nora says that Vickie Bowlen hyper-accelerated the molecules in the ATM, causing a violent chain-reaction that led to it exploding. Eobard Thawne discovered that, much like DNA gives a human body instructions on how to function, the multiverse has its own source code that cannot be altered no matter what timeline you are in. This Time Code, as he calls it, allows him to write notes in a manner that will not be changed no matter how time changes based on his travels. Caitlin says that Grace Gibbon's dark matter has a unique binding quality that allows her to telekinetically manipulate dark matter, even that in other people. Her powers are stronger than her uncle's because her wound was in her head, allowing the dark matter to go deeper into her brain. Nora: Something went wrong! We got Dwyer. We gave him the cure! This should all be over! But another Cicada showed up, took Dwyer and the dagger! Nora: Thawne! Did you hear what I said? Another Cicada showed up! Thawne: I have no idea. Nora: (angrily)You said manipulating the timeline would stop Cicada! You said you knew what you were doing! Thawne: (barely a whisper) I know what I said. I was very wrong. Nora: What do we do?! What do we do now?! Thawne: I can't help you anymore, little runner. Nora:What? You have to help me! Nora:No. There's gotta be something we can do. You you have to help! Thawne: There is only one thing left to do. Tell your father. You tell your father everything. Barry: Hey, by the way, this might not be our only lead. Do you remember that Time Sphere that we built for Thawne? Joe: That big hamster ball thing? Nora: Someone stole one in the future to come here. Cicada: For what? Our Cicada copycat? Joe: It makes sense. (blinks) I can't even believe I just said that. Nora: Hey. You were wrong, you know. Nora: About Vickie not wanting to tell her family about her abilities. It's her choice not to tell them. Barry: Look, keeping a secret like that from her family is It's dangerous. I mean, they might get hurt or worse. Nora: She's just trying to protect them. Barry: I get that, I do, but I-I used to think that keeping secrets from people for their own good was a noble decision, that it would protect them. But when you do that, you just rob those people from making their own decisions. I even did it with you. Nora: Like when you didn't want to take me to your past. Barry: Mm-hmm. I didn't want you to see how painful things got for me as the Flash or how bad things got for your mom. But secrets are like walls, and you can't really know someone with walls between you. The Flash: I don't see Cicada anywhere. Do you? Alice Bolen's Daughter: It's The Flash! Mom, you got Flash and XS cosplayers for the party?! The Flash: (uncertain, eventually speaking in a forced, melodramatic tone) Yeeeeeees, I am the Flash! And I love... soccer! Do you guys love soccer? The Flash: Do you want to... Yeah! Awesome! Come with me! Here, let's play some soccer over here. (starts trying to lead the kids outside) This way. This way! Come on! Barry: Hey, we did the right thing. We kept this family safe. Nora: Then why does it feel like we made everything so much worse? Cisco: Nope. Unless you came here to break something, in which case you'd be the perfect candidate. Ralph: I deserve that. Never should've interfered with Kamilla. Sometimes, I forget how embarrassing I can be. Cisco: I'm not embarrassed by you, and I'm not embarrassed by anyone on Team Flash. You guys are my family. You're not the problem. This is the problem. This is the problem. Kamilla is blissfully unaware of any of the madness that goes on in S. T. A. R. Labs, or that we routinely save the city from evil metas. Ralph: Or that you have a secret identity and dress up in leather and go all pew-pew! Cisco: Especially the leather. (chuckles a bit) She and I, we got a good thing. And being with somebody has never felt so so easy. And when I'm with her, for once, I just feel like a normal dude, with a normal life and a social-media-official girlfriend, who happens to be a very talented photographer and not... a Spider-Person. Ralph: (sighs) It's... that's amazing, man. It really is. And I promise that I will respect that. But I gotta ask... how long do you think you can keep those two worlds separate? Look, my mom dated this guy, Craig, and Craig was a tax accountant and a freelance bull rider. Never let one world know about the other, and it just tore him up. More than those bulls ever did. Cisco: Mm. I should definitely be working. Ralph: Look, the thing is, I get why you're afraid of losing what you have with Kamilla, but if you keep her out of this world, it seems to me that you're always gonna be turning off a part of yourself. That's not right. And if Craig hadn't been crushed to death by that huge filing cabinet I know he'd feel the same way. Thawne/Wells: And so the timeline, it can be malleable, but my knowledge will be intractable. Nora: Dad! I'm sorry I lied to you! Barry: (turning around, speaking bitterly) So am I. When Nora goes to Thawne in the opening scene, the time in his cell is now down to 12:00 minutes. Orlin Dwyer's lung is said to be healing following his surgery. The older Grace Gibbons reveals her identity to Orlin by showing him the dolls he made of her and him. She says that eventually she wakes from her coma and grows up, with Orlin training her to become the new Cicada. Grace says that after she returns from taking care of one bit of business, she will help Orlin figure out how he gets his powers back. This implies that, in the future she is from, Orlin became Cicada again after having taken the metahuman cure. Joe and Cecile question the hospital staff about Dr. Ambres. They confirm that nobody else knows anything about Orlin Dwyer's relationship with Dr. Ambres or where to find Dwyer now. Sherloque completes his translation of the Time Language. He notes that most of Nora's diary is boring and it does nothing to indicate who she is working with, though he's certain she's using the diary to report to someone in the future. Sherloque is revealed to be performing STAR Labs janitorial duties as part of working off the money he charged Team Flash. The Cortex has been remodeled in the wake of last week's attack by Cicada, with a new comm desk. Iris wrote an article about the new Cicada, but her readers haven't reported any new sightings. Ralph said that he checked with Earl Cos and the rest of his underworld contacts but also has no leads on Orlin Dwyer or a new Cicada. The STAR Labs satellite is scanning Central City for dark matter flares but, as Sherloque points out, they don't know that the new Cicada is a dark-matter infused metahuman. Caitlin is said to be at the Tannhauser arctic site, working on figuring out how the new Cicada seemed to be able to control Team Flash. The Starchives are locations outside of STAR Labs where they keep Flash related items that might be too dangerous to keep in their relatively public base. An alarm is triggered at the Starchives site in Kolins Woods, which previously appeared in 503. Sherloque and Cisco find what appears to be Eobard Thawne's Time Sphere from Season 1 in the forest. Ralph and Iris find what appears to be the same Time Sphere still in storage. The Starchive also contains the vacuum cleaner Cisco pretended was a weapon to bluff Captain Cold in 104. A scratch test on the sphere in storage reveals that the Time Sphere in the woods is the same Time Sphere, traveled back in time from some point in the future. This leads them to conclude that the future Cicada stole the Time Sphere. Future Grace robs the evidence locker at CCPD headquarters. She is shown to be able to use her daggers to cut through a reinforced concrete wall. Later, it is determined that all Future Grace took was a single cold case file that had yet to be digitized. Barry is able to figure out what is missing by sorting all the other records at super-speed. Kamilla's full name is revealed as Kamilla Hwang. Cisco and Kamilla are now in a relationship and change their social media status accordingly. Cisco has still not told Kamilla about his life as a superhero or a super-scientist and he wants to keep his life compartmentalized. Kamilla has a gig taking Easter Bunny photos. Ralph mistakes Jason, a barista at C.C. Jitters, for a different barista named Larry. Larry gets Ralph the wrong coffee, either because he honestly doesn't know what Ralph's usual is or to spite Ralph for not remembering his name. Sherloque finds the original blueprints for Thawne's Time Sphere. They have the words "The Timeline Is Malleable." written on them in Thawne's handwriting. The cold-case file that Cicada took involved two people who died in a metahuman attack at the site of an ATM. Cisco vibes the burned concrete around the new ATM computer to see a woman touching the ATM and discharging some kind of energy from her hand just before a young couple walk up to the ATM and it blows up as we see a screaming child in a parked car nearby. The child is Grace Gibbons. Nora recalls Grace picturing herself as Cicada in her mind in 512. This leads the team to the conclusion that the new Cicada is the future Grace Gibbons. Future Grace rages to Orlin Dwyer that the CCPD did nothing to investigate her parents' deaths, despite three witnesses seeing a woman in a hoodie at the ATM before it exploded. The CCPD file contains a piece of the ATM which is charred by dark matter residue. Future Grace has a device in her costume that can track the unique dark matter signature of a particular metahuman. Joe. Barry and Nora track the last person to use the ATM before The Gibbons down at a party being held for a kids' soccer team called The Lighting Strikes. The card belonged to a Vickie and John Bolen. The Gibbons died on May 4, 2017. The ATM that blew up was located near the corner of Kingswell and 42nd. Vickie Bolen says that the ATM sparked after she touched it and she felt something awaken in that moment. She was afraid the police would think she was trying to rob the bank and hoped what she did to break the ATM would just be ignored. Vickie Bolen has kept her powers secret from her family and refuses Barry's offer of police protection after they explain that Cicada may be coming for her. Ralph introduces Kamilla to Iris and tells her Iris is looking to hire a photographer for her newspaper. Cisco is less than thrilled about Ralph interfering in his girlfriend's life behind his back. Sherloque finds a hidden flash drive inside of a compartment in the left arm of Eobard Thawne's old wheelchair from his days masquerading as the Harrison Wells of Earth One. Ralph and Joe explain to Nora that there was once a time when Central City kept metahuman crimes under-wraps in the local press, by order of then Mayor Bellows, in trying to explain why Vickie Bolen might not know that she killed two people. He did this in order to cover up the activities of the metahuman thugs he had on his payroll. This was revealed in 404. Nora has a psychic flash where her eyes glow red. She can feel the presence of the Future Grace Gibbons and her knife. She guesses that she must still have a connection from when she entered her mind with Sherloque's Memory Machine. Vickie Bolen is able to use her energy powers to charge a soccer ball and throw it at the new Cicada. The power acts like a bomb and knocks Cicada off her feet when she tries to block it with her knife. The bomb also knocks down her daughter, Alice. Cecile is pained by the amount of hatred for metahumans she feels inside the comatose Grace Gibbons. Alice Bolen is hospitalized due to the injuries she squired when she is caught in her mother's bomb blast. She is now afraid of her mother. John Bolen is furious that his wife didn't tell him that she had powers and tries to kick her out of their daughter's hospital room. Joe takes him away to try and talk to him. Ralph promises to back off on trying to bring Kamilla into Cisco's work life but politely suggests that Cisco's trying to compartmentalize his life and hide parts of himself from Kamilla can only end badly. Orlin Dwyer reads the police report and notes that no mone was taken from the crime scene, despite the ATM exploding. He says it sounds like the death of Grace's parents honestly was an accident. She is not pleased by this and says he sounds like The Flash and XS. Future Grace tells Orlin that she killed Dr. Ambres for taking away his powers. Orlin tells Grace that all he wanted was to make her happy and safe. He tells her he fully intended to cure himself and her. Sherloque accessess the Gideon computer in the Time Vault to play the flash drive he found. It pulls up a video file of Thawne, log 247, where he discusses the problems of knowing when time is changed by a time-traveler and how he overcame this by discovering a time code that cannot be altered by time-travelers. This leads Sherloque to confirm that the second handwriting sample in Nora's journal belongs to Thawne. Vickie Bolen is able to make peace with her daughter Alice. The new Cicada has the power to block Vibe's breaches, making him unable to pass through them by blasting them with her energy when they open. Future Cicada kills Orlin Dwyer when he tries to talk her down and says that killing isn't the answer to dealing with metahumans and that she doesn't have to live in anger. The Bolens are put into the Federal Witness Protection Program. Sherloque reveals Nora's secret - that she has been working with Eobard Thawne - just as she is about to say it herself, but she can't find the words to explain. The episode ends with Barry locking Nora in one of the pipeline cells. More of the usual nonsense with Cicada being able to have killed The Flash a while ago except for suddenly leaving at the end of the fight scene despite The Flash being helpless and it being unclear just if/when the new Cicada is capable of negating a metahuman's powers. Quite possibly the single-worst episode of the show to date, at least from the perspective of continuity and adhering to the basic rules of the show's universe. What's weird is that there's a number of great lines and the ensemble cast does a great job of selling everything. Emotionally, the resonance of the episode is solid. Logically, not a damned thing makes sense. But at least we won't have to hear Uncle Orlin growling his way through his monologues anymore.